I made this ring holder from a recycled cardboard egg carton as a gift for my friend Debbie’s recent engagement. Would you ever guess that this ring holder was made out of a recycled egg carton if I hadn’t told you? Is this crazy or what? 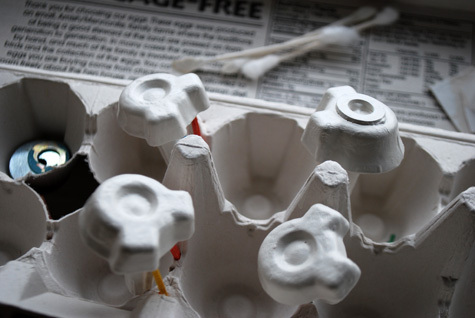 I’ve been eyeing our empty cardboard egg cartons before putting them into our recycle bin trying to picture something simple and useful. Then Debbie got engaged and I thought to make a ring holder. Well, I realized pretty quickly that the pointy separator things on egg cartons are just too big to hold a ring — at least too big for my ring size and my fingers aren’t exactly dainty. So I played around with cutting and twisting and gluing the cardboard and figured out the best way to cut and manipulate the egg carton to create one small enough to hold a ring while keeping a nice shape. 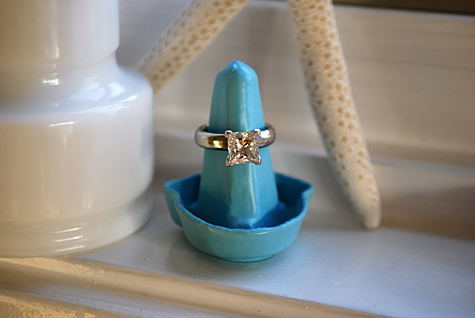 …and here are two different ring holder heights. I was so proud of Debbie’s finished ring holder that I almost kept it [just kidding]. Really I decided to make one for myself to hold my rings while I wash dishes because I do not like the feeling of having water under my rings, no not at all. So it appears that this ring holder is a great recycled crafty gift not only for a newly engaged bride-to-be like Debbie but also for an old married lady like me. 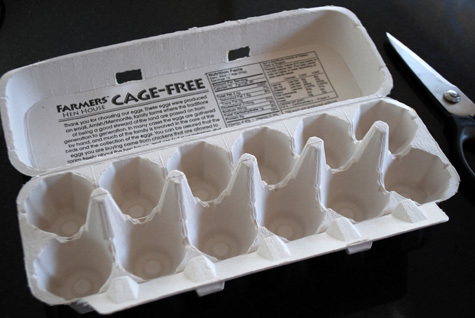 Grab an empty egg carton. 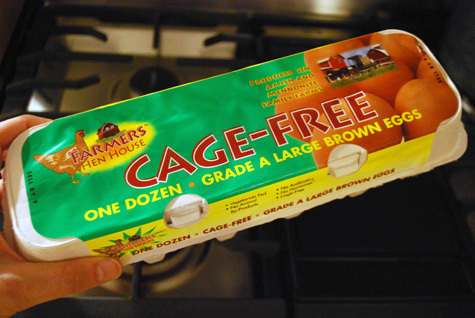 Be sure to use an egg carton with smooth cardboard rather than bumpy cardboard; I used Farmer’s Hen House Brand – Amish and Cage Free which is a smooth cardboard. 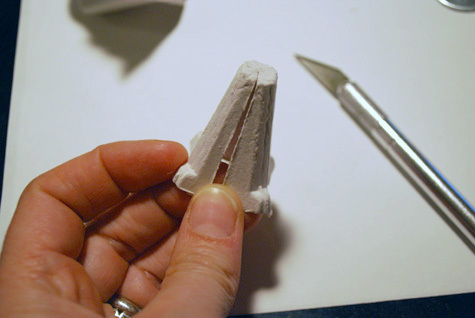 Using your X-Acto knife , cut off one of the pointy separators at the base. Cut if off as evenly as possible. Make a slit from the middle of the top all the way down one of the four slides. Now twist it so the sides overlap. Pinch the top so it is as pointy as possible. Your separator will now have three sides instead of four. Glue it shut using a glue gun and glue sticks [and yes that is old glitter stuck to my glue gun; you never can really get rid of glitter, folks]. Now I forgot to take a photo for this next step so pay attention. You need to trim up the bottom of your pointy ring holder piece. But you are going to want it to lean a bit to the back (and make sure the glued seam faces the back). So use your X-Acto knife to trim off a the bottom of your pointy ring holder piece until it is even all around. Test it by setting it on your counter. Repeat trimming until you have an even bottom that leans a bit to the the back. 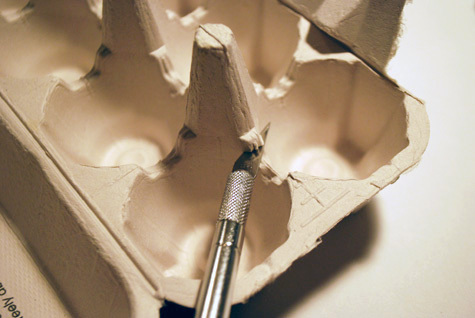 Cut out one of the egg holders from the carton using your X-Acto knife. Cut around it low as evenly as possible. If it’s a little uneven when you’ve finished, just run your knife around it again to even it off. Flip the base over. Glue a small washer on the bottom of the base. Now do this next glue gun step quickly. 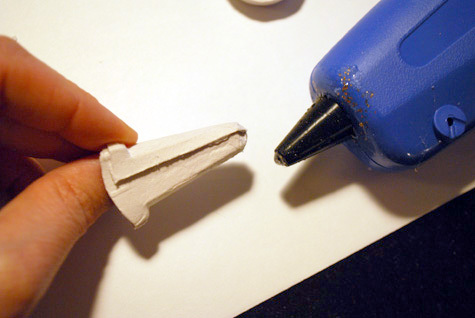 Run a thick bead of glue just on the inside of your pointy ring top. 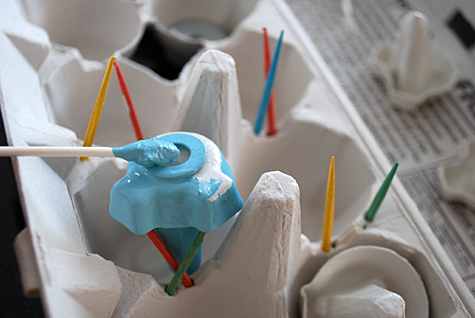 Quickly affix it to the base before the glue starts to harden. 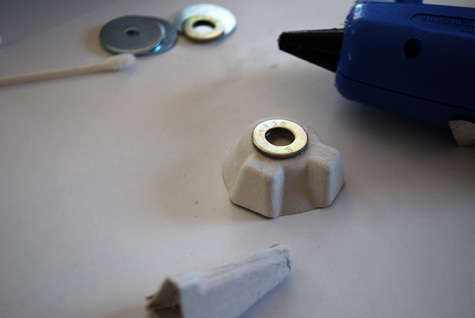 By running your glue just on the inside of the pointy ring top, all the glue will stay inside and it will look nice from the outside. (Note on this sample below, I didn’t squeeze the top to be as pointy as the other ring holders – personally I prefer the ring holders to be a bit more pointy than this one). Now you’re ready to paint. 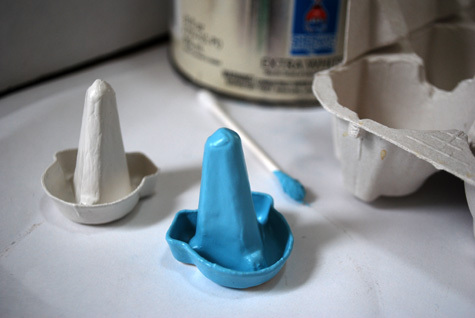 I have a crap-load of leftover paint so thought I’d make both white and turquoise blue ring holders. For simplicity I used white on all of of the ring holders as the base coats and then painted a couple of the ring holders blue for their final top coat. So here’s where I got a little obsessed. I wanted a smooth ring holder. We’re talking SMOOTH, like mimicking a ceramic ring holder as much as possible. So I painted lots and lots of semi-heavy coats – like 5 or 6 of the white – using Q-tips over about a week’s time in the evenings while watching TV. I even let the paint pool a bit inside the base to hide the seams. 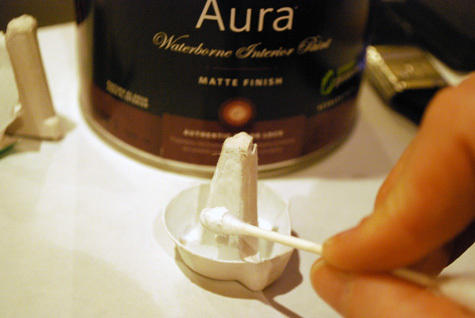 You can paint your ring holder faster; just be sure to let the ring holders completely dry between coats. The painting gets a little time consuming but it’s worth it. 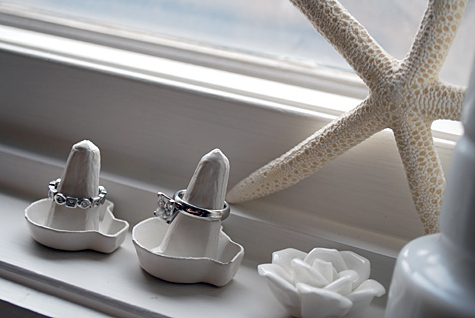 You can use toothpicks to hold the ring holders upside-down to paint the bottoms. 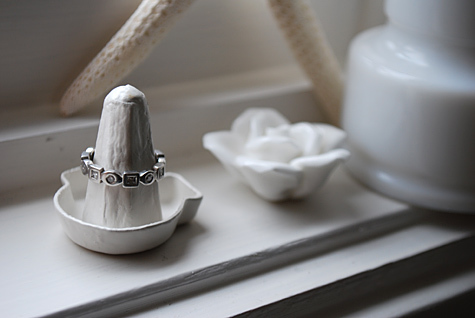 Note that in the photo below I only have the washer on one of these four ring holder samples but I would definitely recommend using a washer on yours – it adds weight and turns it the ring holder into an tip-averse Weeble Wobble. When you’re feeling pretty good about how smooth your ring holder is looking, go ahead and paint a top coat. Again, I used sort of a heavy hand on the paint to make it look as smooth and porcelain-like as possible. And voila! 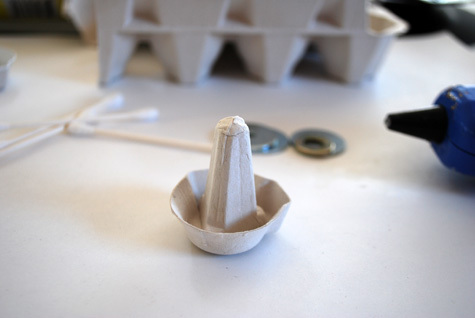 A ring holder made from a recycled egg carton and leftover paint ready to keep your rings safe and mess-free. This is so cool! They really look like porcelain and I love the Tiffany turquoise! Great job! This is such a good idea! My husband forgets his ring all the time hopefully this will help him remember! I tried to make this using an egg carton I had on hand but it didn’t work I will have to go on the hunt for an egg carton like the one you used. By the way you are amazing!!! This makes me want to take my rings off to do dishes! so clever!!! and eco friendly! Handles or absolutely anything infor a protective coating. Color, only takes one coat and is not 100% waterproof! This is such a great idea! 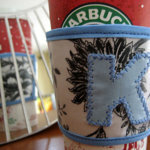 And a wonderful tutorial – thanks for all the detailed steps and photos! What a fabulous idea! I will be making some to display my jewelry soon. By the way, why did you glue a washer to the bottom? Hi Jessica, I learned when I used to sell handbags to boutiques that weight helps convey quality. 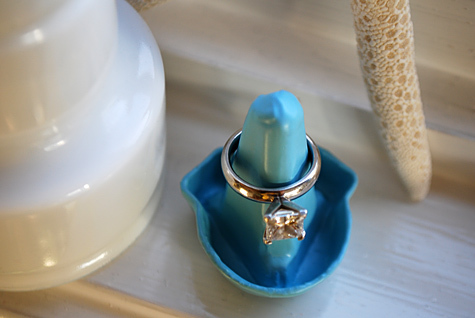 And in this case, it also helps keeps the ring holder from being too tippy. So I glued a washer to the bottom to make it more substantial as well as more stable. Thanks for asking! 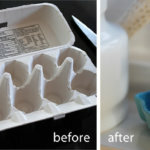 I have a lot of rings so just leave the egg carton as is and then paint a desired paint color on the inside of the carton.. You can then put your rings on each point and put ear rings in the little dish parts next to your rings. 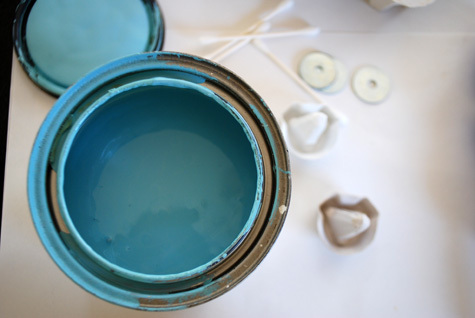 Leave outside of carton as is don’t paint it and it will be a litle safe for your jewelry and no one will know. 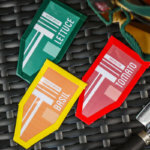 Maybe even keep them in yout fridge to realy be safe. Nanette ST.Pierre Phoenix Az. Just another thought for the smooth look. 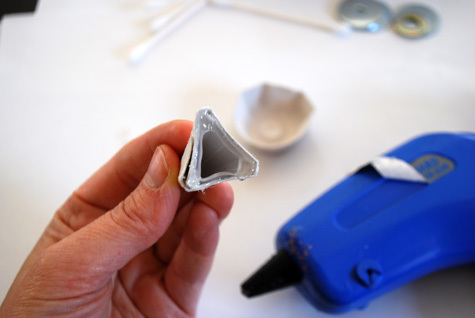 If you trim the pointy part down just a hair more, you can thin down(*not watery) some’ texturing’ drywall mud or POP and dip your piece into that..gives it a ceramic look after painted ,and keeps the carton part a little more protected from the water. 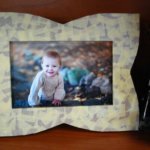 I am in the midst of making a larger version of your idea for a display and love your clever invention. Thaks! Hey Indelibella, that sounds really cool, waterproofing more is smart …although I’m not sure what POP is so you’ll have to fill me in. 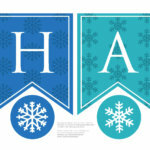 Would love to see what you’re making when you’re done and share with my followers. Thanks for sharing your addition! 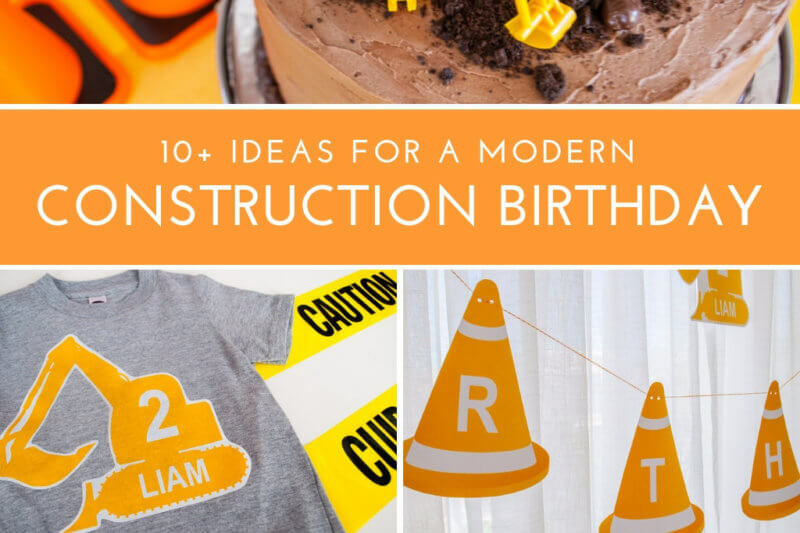 I love love love this idea. I was just talking to a cousin of mine this morning about how I should be taking my wedding ring off to cook, do dishes etc, and sleeping as I’m getting a reaction on my finger. 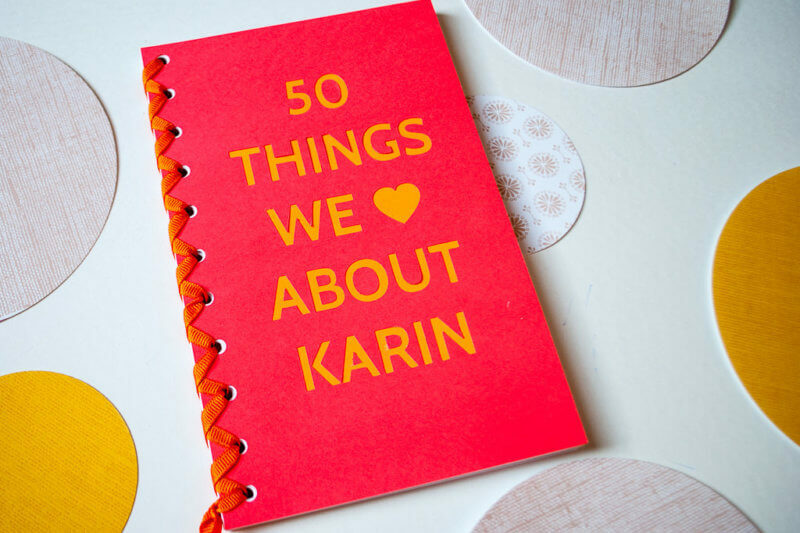 I’m going to make two of these, one for the kitchen and one for my bedside table! Thanks! Send me a pic and I’ll share on with my followers. And check out one of my reader’s ideas in the comments section to dip it in plasti-dip. Not terribly environmental but I bet it would turn out super smooth. I saw the ringholder on Pinterest and thougt I had to give it a try. 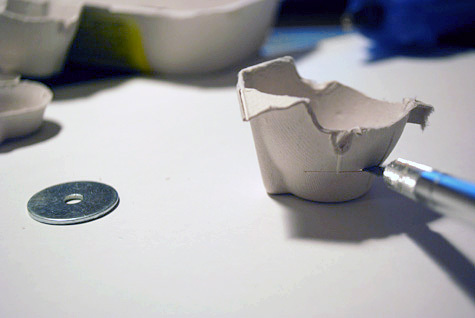 The tutorial was very clear and helpful, unfortunately it seems that Swiss egg cartons aren’t that smooth, and even after several layers of paint, the carton pattern is still visible. Buth otherwise, it meets up with my expectations. Have a look at my blog, where I put some pictures of it, referring to your tutorial: http://www.rebekkascraftroom.blogspot.ch/2013/07/un-presentoir-digne-dune-belle-bague.html Thanks a lot for the idea! 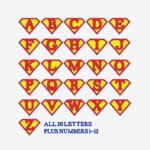 Hi Bettina, you’re awesome for sharing this with me! Made my day. I think yours looks great, and such a cute ring. 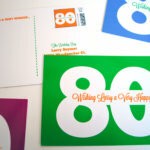 If it’s OK with you I’ll share your post on the Merriment Design Facebook page. A couple readers had some comments about how they made it more smooth. One person suggested Plastidip which I haven’t used before but looks really cool. Enjoy it! Hello, It is fabulous idea. I will try to do it for my best friend. She has a birthday soon and I am going to steal the idea for ring holder. In my opinion it will look perfect in red. I will paint it in red color. Thank you for sharing this tip! Thanks, Amber! 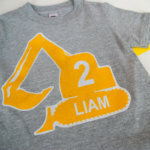 I think it will look really cute in red. 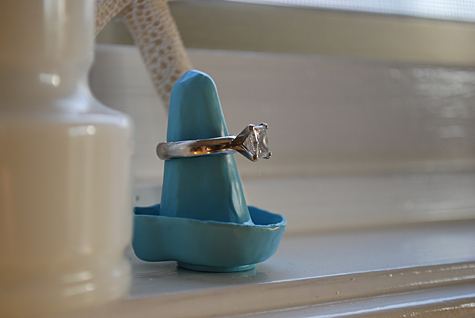 I just included this awesome ring stand idea in a Buzzfeed list I currateed called “16 Gifts You Can DIY From Stuff You Already Have Lying Around.” Thanks for the great idea!